One of our favorite reads is the MeetingsNet site because it’s always filled with great advice for meeting planners from industry experts. Be sure to check out the article, “On a Planner’s Plate: 37 Events, 45 Sites, Too Much Email,” posted on June 28. Not only will you find tips for how to boost your efficiency, there’s also a great downloadable meeting planners’ benchmarking report by Social Tables. It reinforces our strategy priority at GoGather of first understanding a client’s overall business goals so event goals support them. 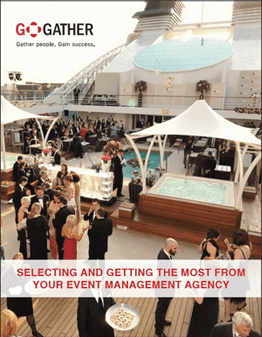 This focus guides the entire event planning process, making it easy to make decisions about what to do or what to avoid. You’ll also learn more about why corporate planners should consider bringing on an event management company as a partner for success. Using technology as a collaboration tool and hiring certified strategic meetings management professionals are also on the “recommended” list in this benchmarking report.